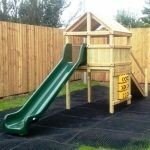 Playground Safety Surfaces are essential in all public play areas and strongly advised for most garden play equipment. When used in conjunction with fences, these Safety Surfaces also help to clearly identify a dedicated play area. Many customers want to provide a Safety Surface, however, the range of options can be confusing. As a result, we have put together a brief summary of the options, in approximate price order. Rubber crumb mixed with resin on site. Excellent finish, very durable & many designs but needs extensive ground preparation. Rubber crumb & resin slab cut to 1 sqm tiles in a factory. Ideal for concrete/tarmac areas. Good finish & very durable. Rubber shred mixed with a resin on site. Best on compacted soil. Textured finish & reasonably durable. Grass 'carpet' on top of a 'shock pad' underlay. Ideal for smaller spaces. Big range but you get what you pay for. Shredded pieces of rubber that arrives in bags. Great for shaded areas. Range of colours & durable but depth can vary. Larger pieces, these are chunks of rubber that arrive in bulk bags. As above. 1.5 sqm soft rubber sheet. Lay on established grass only. Cheap, easy to install & the grass grows through the holes to disguises the mat. Many types of bark/shredded timber. Fine for all areas. Cheap, natural & easy to install but needs maintenance & topping up. 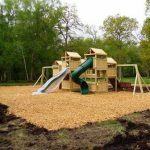 Established in 2003 we have completed commercial installations in many Parks, Schools, Pubs, Nurseries and Hotels. 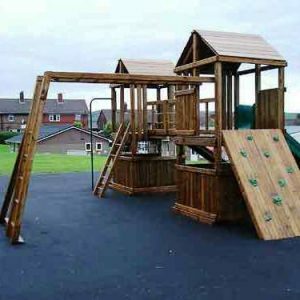 As well as Playground Safety Surfaces, we also supply a full range of commercial play equipment and a comprehensive installation service. So, if you have a specific project to discuss or simply have a few product questions, please feel free to contact us. 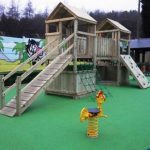 A fantastic soft surface made from rubber granules mixed with glue, we can provide Wetpour Rubber Safety Surfacing as part of our playground projects. Please contact us for full details and a quote. Available in a variety of colours, depths and patterns.